Sky News has been covering #NationalRefillDay which is encouraging everyone to use reusable water bottles to cut plastic pollution. The campaign led by City to Sea and Water UK aims to make refilling your bottle as easy, convenient and cheap as possible by introducing refill stations on every street. You can download the refill app here which will direct you to more than 12,000 free refill stations nationwide. 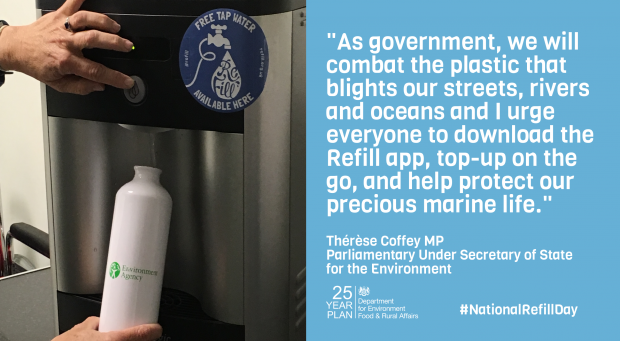 I News is highlighting the number of retailers and organisations now offering free refill stations and earlier, Environment Minister Thérèse Coffey posted a video of support for the campaign on Twitter. 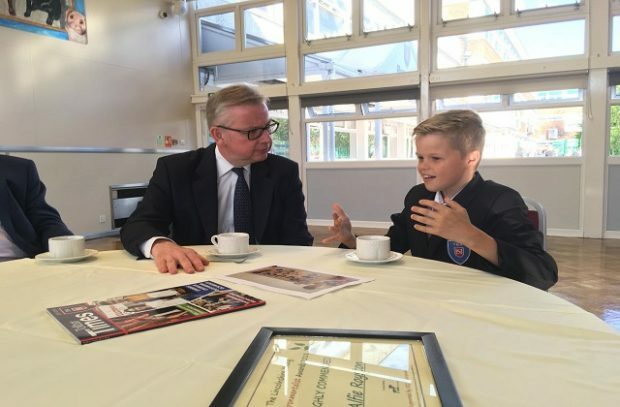 Also today, we tweeted a picture of Environment Secretary Michael Gove presenting Alfie Royston from Tollbar Academy with a #refill reusable bottle in recognition of Alfie’s award winning crusade against plastic pollution. The HuffPost has been testing the best reusable water bottles, there has been further media coverage including on Spirit FM and On the Wight, and #NationalRefillDay on Twitter includes posts from the Environment Agency Chair Emma Howard Boyd and hundreds of others. Today the Guardian ran a story on antimicrobial resistance post-Brexit which makes false claims about the future regulation of antibiotics in farming after Brexit. The UK played a key role in the drafting of new EU regulations to cut use of antibiotics on farms and fully support this new legislation. We cannot commit to adopting these in the UK because they do not come into force until we have left the EU. We are therefore not constrained by this legislation and with negotiations still ongoing, but we could even go further than this EU legislation if that is what we see fit. The UK is a world leader in tackling antimicrobial resistance and our approach will not change when we have left the EU. We will use Brexit as an opportunity to enhance animal welfare wherever possible. The article claims that at a recent stakeholder event hosted by the Veterinary Medicines Directorate (VMD), their Director of Operations said the Government would allow farmers in some circumstances to continue to mix antibiotic feed and drinking water to groups of animals for disease prevention. These comments are both untrue and they are also based purely on hearsay. We have asked the Guardian to correct these inaccuracies. Leaving the EU will not change our commitment to tackle antibiotic resistance and the UK will remain a world leader in helping preserve these medicines for future generations.